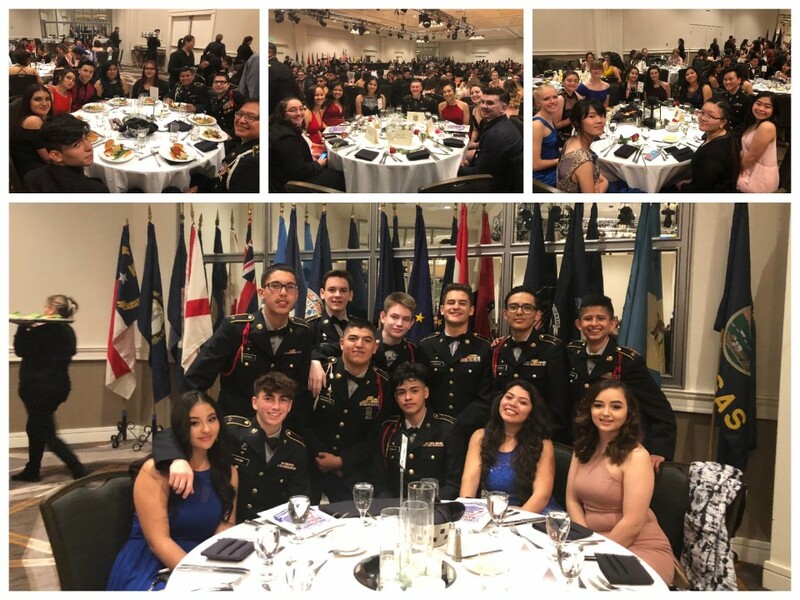 On Friday, March 9, more than 600 Denver JROTC (Junior Reserve Officer Training Corps) students from 10 DPS schools attended the 125th annual Denver Military Banquet and Ball. The cadets dressed up in their uniforms and formal wear, and for many, this was their first time to experience a formal dinner and dance. In JROTC, students are assigned ranks based on a variety of factors, such as skills achieved, leadership positions held and recommendations. Each year, DPS JROTC schools nominate one cadet to compete for the district’s highest position, the ball commandant. Commandant candidates undergo an intense and thorough selection process that includes sitting with a panel of judges from across Denver. Only one student receives this honor each year. Cadet Amorous (Amie) Simone, a senior from George Washington, was awarded 2018 Ball Commandant. Amie serves as the public affairs officer for all of Denver’s JROTC programs as part of the Brigade Staff, where she leads communications efforts. She is also part of George Washington’s Honor Platoon and has participated in the JROTC Leadership and Academics Bowl (JLAB). In addition to her JROTC responsibilities, Amie has a weighted 4.0 grade point average (GPA), is the captain of her varsity female lacrosse team, the president of nonprofit Patriots Care, Inc., a member of National Honor Society and a student in the International Baccalaureate program. With her appointment to numerous leadership roles, Amie has learned how to thrive and rise above obstacles. “JROTC has definitely helped prepare me for anything life has to offer. It’s instilled the concept of being a gazelle and a lion in the world. Either I’m going to be the gazelle and lightly tread in the world, living a mediocre life, settling, or I’m going to be a lion and dominate everything before me. Without JROTC, I wouldn’t have the confidence to say that I will be that lion and tackle whatever is next after high school,” said Amie. Aside from JROTC, she attributes her confidence to her biggest life influence, her mother. “My mother has instilled in me the drive to be the best I can be, making sure I set goals at or past my limit,” explained Amie. With that guiding light, she recently enlisted with the United States Marine Corps. The night’s distinguished guest of honor was Colonel Michael Stinnett, Army JROTC Director for the more than 1,700 programs worldwide, a West Point graduate and combat engineer who completed several tours in Iraq and Afghanistan. “Over the last few days, I’ve had the honor to visit five DPS high schools. Denver has some of the most diverse schools I’ve ever seen, and that is truly what makes your program so special. You are all very talented young future leaders, and with your diversity, you are able to learn from one another,” said Col. Stinnett. Added commandant nominee Ashley McCord from John F. Kennedy High School: “I’ve had the opportunity to take on two leadership roles this year within JROTC. The program has not only helped me plan for my future; but it has also taught me the value of being a responsible, strong leader. ” Ashley recently received her acceptance letter to the University of Denver, where she plans to study social work and advocate for kids.